The CAPA Summer Dublin Internship is a six-week, four-credit summer internship program in Dublin, Ireland. This internship program through CAPA operates out of Griffith College, a small Irish college located in heart of Dublin, and boasts many opportunities to interact with Irish colleagues as well as Irish students and other international students. 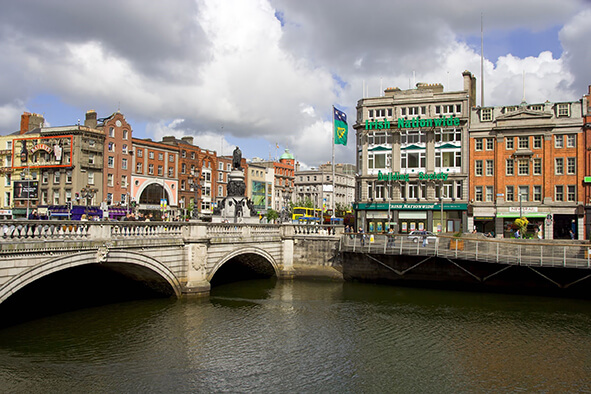 Dublin is not only a historical and contemporary cultural center for Ireland, but a modern center of education, the arts, administration, economy, and industry. Students will have the opportunity to be immersed in their field of choice through a full-time internship. Through a combination of cultural activities and excursions offered through CAPA, as well as opportunities for individual travel and exploration, students can further enrich their academic and professional experiences while enjoying life in Dublin. Students on this program are responsible for booking their own flights. CAPA will provide information about arrival date and time, as well as instructions about traveling from the airport to their residence in Dublin. Once on-site, a CAPA member meets students at their residency and takes them to Griffith College for orientation. Orientation will address essential issues such as health and safety, CAPA services, public transport, culture shock, and internship-specific topics (i.e. interview prep and workplace adjustments). Orientation includes a walking tour of the surrounding neighborhood to identify important locations such as the nearest grocery store, pharmacy, bank, post office, and public transport options. Orientation concludes with a reception with CAPA staff, dinner, and speakers. Internship Course: Students will take a full-time internship consisting of 28-32 hours per week - approximately 160-180 hours in total across the six-week program for 4 credits. As part of the onsite arrival orientation, students will participate in an interactive workshop that examines issues of culture and workplace integration, site-specific information, and effective interview techniques. Final internship placements are contingent upon a successful interview with the internship-host organization, which will take place after the orientation. Each intern will have a site supervisor based at their organization and CAPA staff will visit each site throughout the semester to meet with the interns and site supervisors. Blog Posts from CAPA Interns: When searching for an internship in your desired field, please do not use the search box on the right side of the screen. You can simply scroll down to find the field in which you're interested, or better yet, you can use "Ctrl F" (the search function on most computers) and type your internship field into the search box that appears inside your browser (English or Accounting or Media, for example). All courses appear on the Rollins transcript as transfer courses and the grade will not be factored into your Rollins GPA. Dr. Darren Kelly is the instructor for CAPA’s summer academic course Learning Through Internships (LTI). Dr. Kelly is currently based in Dublin and serves as an Adjunct Professor with Champlain College and the Institute for International Education Studies (IES). Dr. Kelly will teach the LTI course as well as support interns with any academic or professional challenges they face. Onsite staff include a CAPA-employed Resident Director, Susanne Bach, based at Griffith College and support staff in Griffith’s International Office who can assist interns with anything they need. All staff provide 24-hour emergency support. All staff provide 24-hour emergency support. Each student has a site supervisor that not only serves as a supervisor, but will also assist CAPA staff with tracking of hours, monitor the interns’ progress, and completing formal evaluations of the intern. Interns will live in a shared furnished apartment in Dublin. Apartments usually have two rooms, with two students per room, and shared common areas, bathrooms, and kitchen facilities. They include WiFi, all utilities, and weekly cleaning/linen changes. CAPA reserves the right to house Rollins students with students from other programs and/or in co-ed apartments in which males and females will be roomed in single gender bedrooms and have access to separate single gender bathrooms. There is no meal plan included on this program. Students are expected to buy groceries and cook meals for themselves or use the Griffith cafeteria and other local eateries. From humble beginnings as a Viking trading port, today’s Dublin is a modern, cosmopolitan city with rich academic, cultural, and professional opportunities. Ireland’s capital, Dublin has the feel of a village while boasting a variety of major attractions akin to the world’s great cities. It is well known for its outstanding playwrights, actors and theater and also hosts a variety of events to suit all tastes and genres: from outdoor festivals and art exhibitions, to special cultural activities. A travel card for use on the Dublin buses, DART, and suburban rail is included for the dates of the program. A Hop on-hop-off tour of Dublin is included in the program fee and takes place following orientation. Additionally a full-day excursion to Belfast that includes transportation by coach, tour guide, and entrance fees is included. Rollins students will join other CAPA students on this excursion. In addition, CAPA’s MyEducation program links academic content to the living city and plugs students directly into Irish life not usually open to visitors. Tuition, program administration, LTI course and internship placements, orientations, housing in apartments or student residence halls at Griffith College, hop on/hop off tour of Dublin and a full day excursion to Belfast, a travelcard for use on the Dublin buses, DART and suburban rail, and health and emergency insurance.